Admittedly, our selection for The Gift Box is only one unique gift idea. From this page, however, you can begin to create your own unique gift ideas. Starting with these sturdy handcrafted Western Red Cedar wood gift boxes, you can then add the Pacific Northwest treats you prefer. For example you may want your gift box to include 2 lbs. (max.) of your favorite Olympic Peninsula Alder Smoked Salmon™. Or, maybe you want canned smoked seafood... or, two Samplers, or one Sampler and a few cans of Pacific Smoked Oysters... or, 8 oz. of Alder Smoked Salmon Pepperoni Stix and a Canned Sampler? Whatever tantalizing gift ideas you create, rest assured, your brawny Cedar gift box will be a cherished memento that can last a lifetime. It's a good thing too, since... the savory gifts within -- won't! Measuring 11.5" x 6.5" x 6" tall and a sturdy 1/2" thick throughout, these fragrant Western Red Cedar wood gift boxes feature a fully reversible top lid. With the top able to be face up or down, and, opened left or right, your gift will offer lasting utility. Please remember, you may always add a free gift card to any order. Whether you're a smoke-it-yourself enthusiast, or a corporate buyer searching for personalized gift ideas, you'll find these sturdy gift boxes a solid gifting solution. 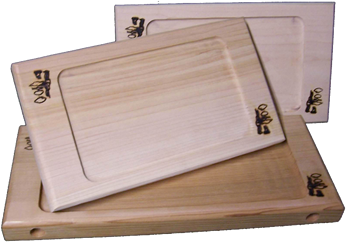 Each case includes 6 handcrafted Western Red Cedar Wood Gift Boxes. 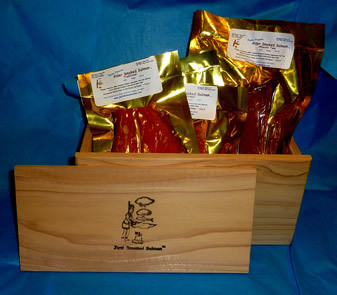 By purchasing other Olympic Peninsula Smoked Salmon Products in bulk as well, you'll save money while creating memorable & unique gourmet gifts. When ordering your gift box cases, you may "note" within your shopping cart an unbranded lid preference. For private label branding details, please email us. *Gift Box cases shipped via FedEx Ground within the continental United States only! Please allow 1-2 weeks for delivery. Washington State Residents add 8.2% sales tax for non-food items. Please allow up to 3-5 weeks for shipping via USPS parcel post for Alaska, Hawaii & U.S. Territories orders.